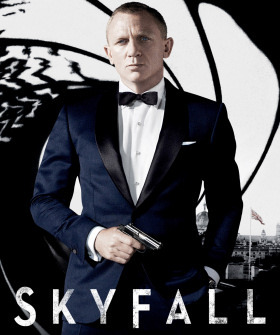 The latest James Bond film "Skyfall" will make its debut on US premium cable on Friday 9th August at 8pm EST. It will kick off a marathon of other 007 movies running until 5am EST on Monday 12th August 12th. The season will also include "Everything or Nothing: The Untold Story of 007" and the non-canonical "Never Say Never Again". All of the movies with the exception of "Die Another Day", "Casino Royale", and "Quantum of Solace" will be shown. Daniel Craig's third outing sees 007 left for dead...only to rise again in pursuit of global cyber terrorist Raoul Silva (Javier Bardem). Bond's travels to take him from Shanghai to Macau but it's back in Britain where the rather-too-well connected Silva is wreaking havoc. It's emerging that M (Judi Dench) is his prime target and an audacious bomb attack on London's MI6 HQ shows that Silva means business. Director Sam Mendes makes a daring departure from the well-worn Bond template to fashion a first-rate thriller carefully balancing quips with carnage. Craig is now totally at home in a role that recognises its age limitations and the taut story lets fly with a couple of genuine shocks for Bond's 50th birthday. Starring: Daniel Craig, Dame Judi Dench, Javier Bardem, Naomie Harris, BÃ©rÃ©nice Marlohe, Ralph Fiennes. Thanks to `Perdogg ` for the alert.